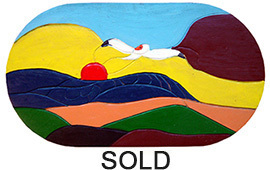 Gilbert Desrochers was born in Tiny Township on the southern end of Georgian Bay. He only attended school for two years and went to work with his father and brothers on the family farm until he was twenty-five when he began to wander and only returned when the work or money ran out. At one point Gilbert was incarcerated at the federal penitentiary in Kingston for stealing a barge. There he worked for a while in the carpentry shop, until he became paranoid and uncontrollable and was put into solitary confinement. He spent two years in Kingston and it was there that he had his first religious experience, when God appeared to him on the walls. In 1975 he was working in Toronto and while looking in the garbage in an alley something struck him from behind. When he turned around no one was there. He concluded it must have been God. 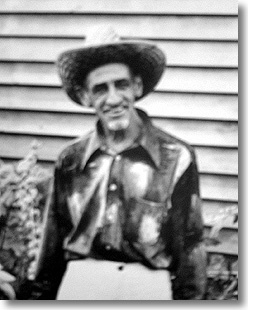 After his religious experience in Toronto, Gilbert moved to his brother’s farm near Perkinsfield, where he lived in a small trailer and attended church regularly. “I promised myself that never would they catch me again to lock me up. That’s why now I’m always alone.” It was here that Gilbert started to carve. He continued to have visions and said that he began making sculpture because God came to him in a dream and told him that he had to make something, then gave him visions of things to make. This dream recurred, and after the third time Gilbert started making carvings. 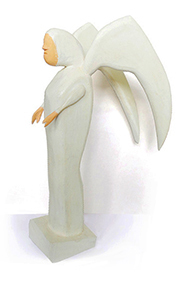 Gilbert was discovered by artist John Hartman in 1980 when Hartman noticed one of his angels on the front lawn of Gilbert’s brother’s farmhouse. Hartman began to visit regularly and to document Gilbert’s work and his life. A solo exhibition of Gilbert Desrochers work was held at the McMichael Canadian Art Gallery from November 3, 1991 to March 1, 1992. 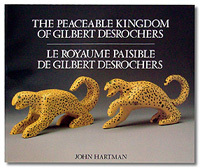 Ref: John Hartman The Peaceable Kingdom of Gilbert Desrochers (1991).